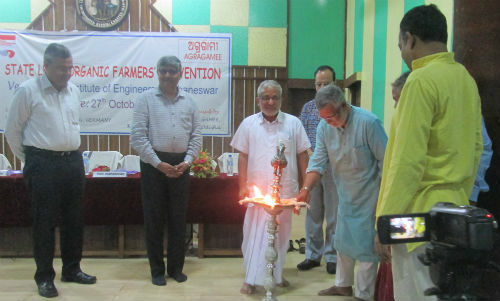 Bhubanesswar: AGRAGAMEE, Kashipur , in collaboration with Rosa Luxemburg Stiftung, Germany organized a State Level Organic Farmers Convention at Institute of Engineers, Bhubaneswar on 27th October. Above 300 Organic Farmers from different parts Odisha mostly on tribal areas and Policy Makers, Senior Bureaucrats , Agriculture Scientists, Researchers,, NGOs, Academics, Civil Society Organizations participated in the convention and discuss about various issues related to Agriculture, Farmers and Organic farming. Inaugurating the Convention, Mr. R.Balakrishnan, IAS, Development Commissioner, Odisha stress that now time has come to give more emphasis on Organic cultivation and also for cultivation of Millets. 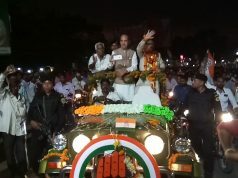 He shared that government has already take steps to promote organic cultivation by implementing Parmarika Krushic Vikash Yojana and Millet Mission in Odisha. Govt. has now working to develop a policy on organic farming in the State.He also assure that Govt. will plan to provide support to help farmers who practice organic farming. Prof. Radhamahan thanks to Agragamee to organic a convention for the organic farmers first time in Odisha to promote organic farming in the state. 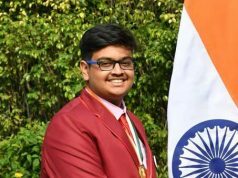 Mr. Devendra Sharma, Disinguished Food and Trade Policy Analyst spoke about about the agrarian crisis in all over India. Mr. Achyut Das, Director, Agragamee sharing about the objective of the convention are to get together of organic farmer in all over Odisha, to neutralize the negative impact of Chemical and Commercial Agriculture and promote Sustainable Agriculture, to build up support base for the Organic farmers who are looking for Minimum support price, certification, processing and marketing and how to bring back people, especially youths back to Agriculture. Mr. Tauqueer, Project, Manager, Rosa Luxemburg Stiftung spoke about the objectives of Roga Luxemburg Shiftung . In the different technical session, discussion on different topic like farmer perspective on organic farming, National Perpective, on Odisha Perspective on organic farming. During the different sessions, Prof Radhamahan, eminent environmentist, Mr. Jagadanand, Member –Secretary, CYSD, Mr. Natabar Sarangi, Organic farmer and conservationist, Mr. Raju Titus, Eminent Natural Farmer, Madya Pradesh shared their experience to the farmers who comes from different parts of interior pockets of Odisha. On the National Perspective, Mr. Pravash Sharma, IAS, (Rtd), Farmer Secretary of Agriculture, Madhya Pradesh, Mr. Ashok Dalwai, IAS, CEO, National Rainfed Area, Development Authority,Govt. of India, Mr. Basant Kumar Kar, CEO, The Coalition for Food and Nutrition Security shared their view on National Perspective on Organic farming. In the State Perspective on Organic farming, Mr. Manoj Ahuja, IAS,OSD, Department of GA, Odiaha, Prof. Prabhu Charan Lenka, Ms. Sabaramati, Sambaav and Mr. G.K.Dhal, IAS, Agriculture Production Commissioner, Odisha shared the government strategic and development of plan for organic farming and farmers. In the summing up session, Dr. Aurobindo Behera presiding in the last session and call for give importance to Organic farming for care of people’s health and health of soil. In the concluding remarks, Mrs. Vidhya Das, Joint Director, Agragamee shared shared about the findings of the of the discussion of the entire day.